Discussion in 'Standard E-Cigarette Reviews' started by Tim Wiseman, Dec 26, 2018. Hi ECF members, In this review i take a look at the Flint Starter Kit 1000mAh from Geekvape. The Flint Starter Kit 1000mAh was supplied for the purpose of this review by Carrie from Geekvape. 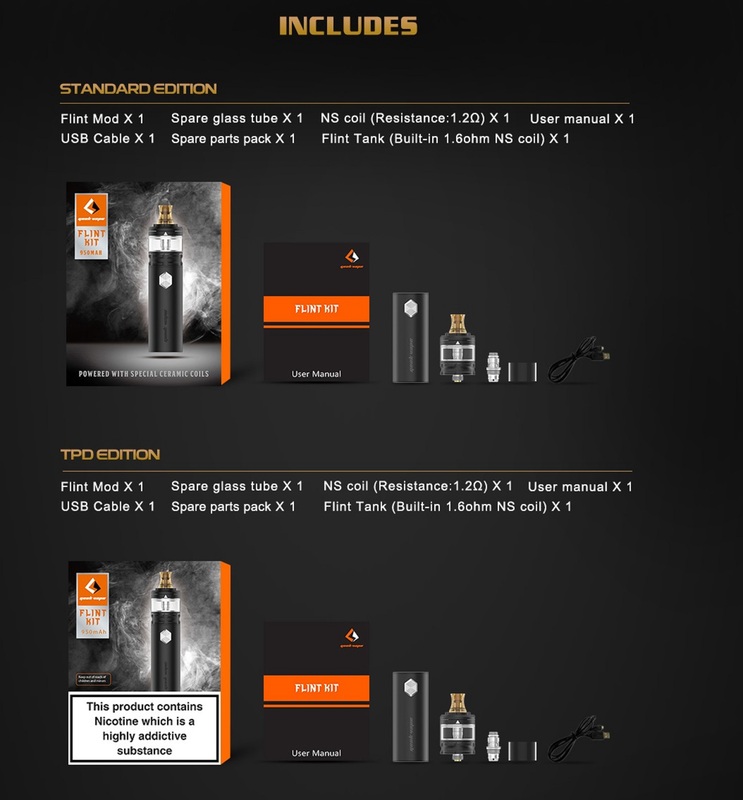 Geekvape end the year with a MTL all in one kit which i suppose technically is a vape pen kit rather than an AIO kit but tank and battery are so made for each other (although Flint tanks stands up on it's own merits) i'm not going to split hairs if someone refers to it as an AIO. The kit isn't the usual direct output serving we usually get with vape pens but has 3 different constant output levels and is marketed as ideal for nic salts and high nicotine e-liquids and also has a Water resistance level of IPX5 so no worries about vaping this in the rain. Coming with both a 1.6ohm and 1.2ohm N80 NS coils and having 5 different MTL airflow draw options the Flint Kit is well worth a look! The Flint MTL Kit came in the usual plain Black cardboard box packaging that Geekvape samples come in. On opening i was amazed how small the battery is and how short the Flint tank is even when assembled the kit is tiny, ergonomic and stealthy. I received the Black version, it's also available in Rainbow, Gunmetal and Serenity Blue. 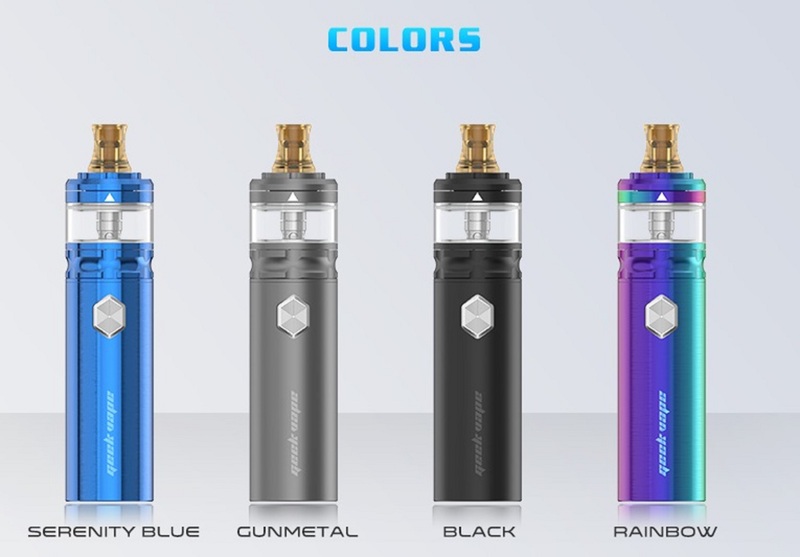 The tank up top has a MTL style ultem drip tip then the top-cap steps down to where there is an arrow head to show where to push to slide open to fill. the base of the tank as a concave airflow control ring and then tapers out to meet both the battery and the glass sections, this base section has heavy textured design. The front of the battery has towards the top an hexagonal machined fire button then on the vertical we have printed "geek vape". The back of the battery has the micro USB port towards the top and to one side of the battery we have a small hole that allows LED to show indications. Finally the base of the battery has plenty of venting holes, the kit is well made and has what seems to be a quality durable finish. The Flint tank is simple in it's design, The base unscrews which unscrews the coil from the top section central, which isn't an air pipe as the Flint uses the top section of the coil head as it's air pipe. Then the glass (you do receive a spare glass section) can be wiggled free from the top o-ring, when the tank is together the glass is also sealed by a bottom o-ring. The coils are tiny MTL coils which screw straight into the base, the installed coil is a N80 1.6ohm coil and the spare a N80 1.2ohm coil which are both NS coils (specially made to suit nic salts and high mg e-juice) what the difference is (if their really is any difference) between a 1.2ohm and 1.6ohm coil from a couple of years ago to one that's supposed to be specially suited for nic salts is beyond my limited knowledge. The Flint has a slide back top-fill system which where you push is clearly marked, the top slides open and secures back into place with excellent tolerance. The top really does open and close very smoothly and when open the Flint has a very large filling port so no issues over what nozzle sizes can be used. Up top we have a MTL shaped Ultem drip tip, the drip tip is fixed which is a con although after using it for me it's more of a con because i can't use the drip tip on other MTL tanks rather than not being able to fit a different one on the Flint. The airflow control ring again moves with excellent tolerance and has a stopper, the control ring has a single hole which you then move to line up with one of the 5 different sized air hole inlets. 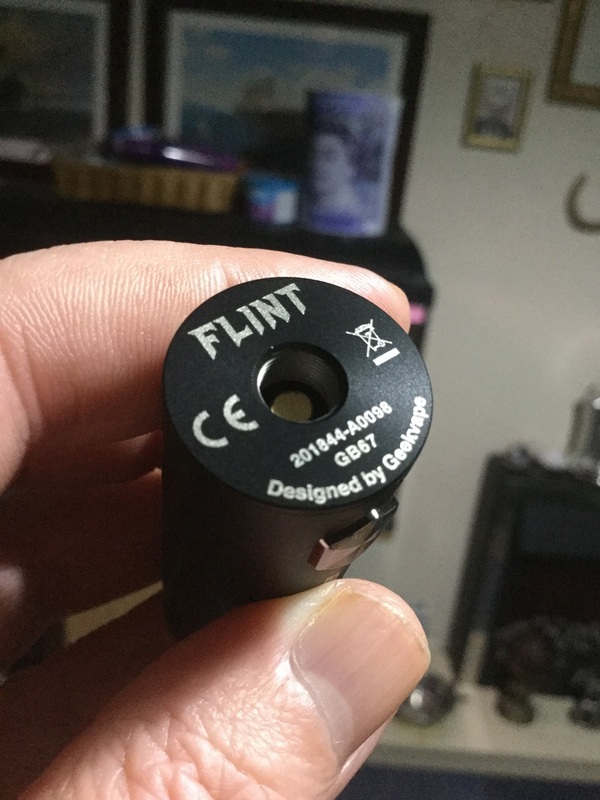 The bottom of the Flint has branding and safety stamps as well as a protruding 510 pin, it as an e-liquid capacity of 2ml. The Flint is the usual 5 clicks of the fire button to turn on and 5 clicks to turn off. The Flint is not a direct output device like the vast majority of vape pens but instead has 3 different constant output levels. To change between the power levels is 3 clicks of the fire button so with each 3 clicks you move to the next level (it does round robin). The power level that is active is indicated by what colour the LED is, after changing level the LED stays solid lit on the level indication colour for 3 seconds. 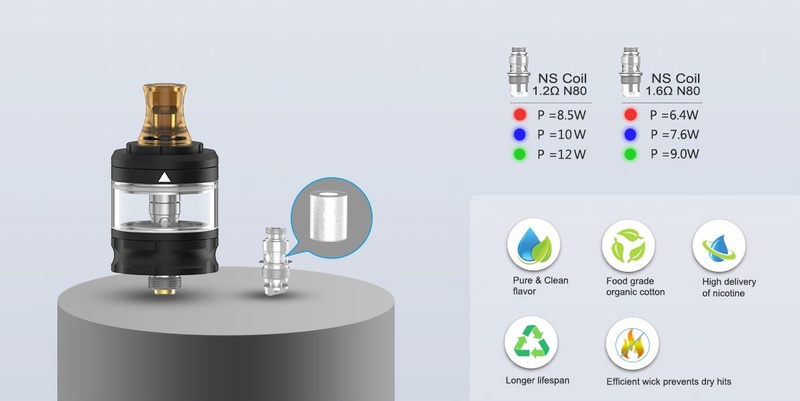 The levels are Red which is 3.2v which gives 6.4w with the 1.6ohm coil and 8.5ohm with the 1.2ohm coil, the next level is 3.5v which is indicated by a Blue light, this level gives 7.6w with the 1.6ohm coil and 10w with the 1.2ohm. 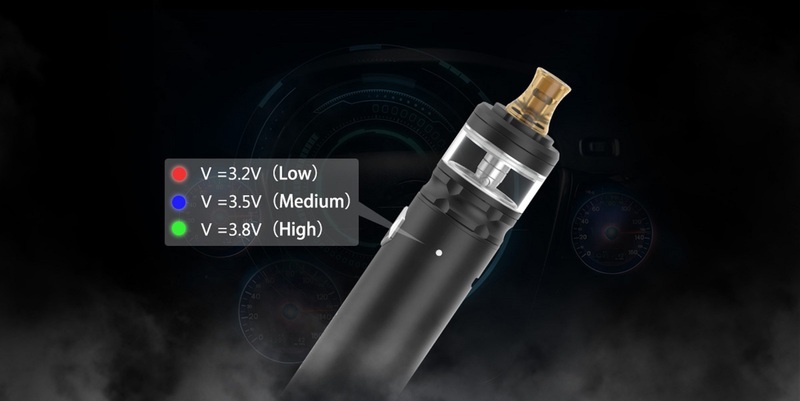 The highest level is 3.8v which is indicated by a Green light, this gives 9w with the 1.6ohm coil and 12w with the 1.2ohm coil. The LED also shows battery status indication by lighting up while vaping, when the light goes Green the battery is between 70% and 100%, when the light goes Blue the battery is between 31% and 69% and finally if the light is Red then the battery life is 30% or below and you need to think about charging. 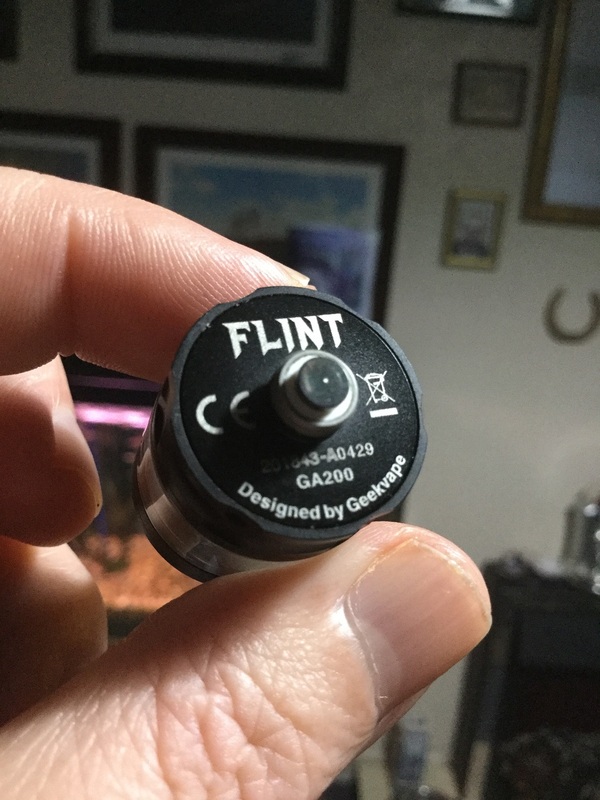 The Flint also comes with the usual safety features which include 10 seconds cut-off, Low battery protection, Overheat protection and Short circuit protection. The Flint boasts a Waterproof level of IPX5 which is more of a water resistance rather than the level 7 that the Aegis has. It's resistance level means it has protection from water projected from a nozzle which means it shouldn't suffer damage from leaking e-liquid (not that the Flint tank leaks, i suffered no leaking whatsoever) and will be fine using the device even in heavy rain. While the kit feels and vapes as if battery and device are made for each other (which they were) both can be used independently. 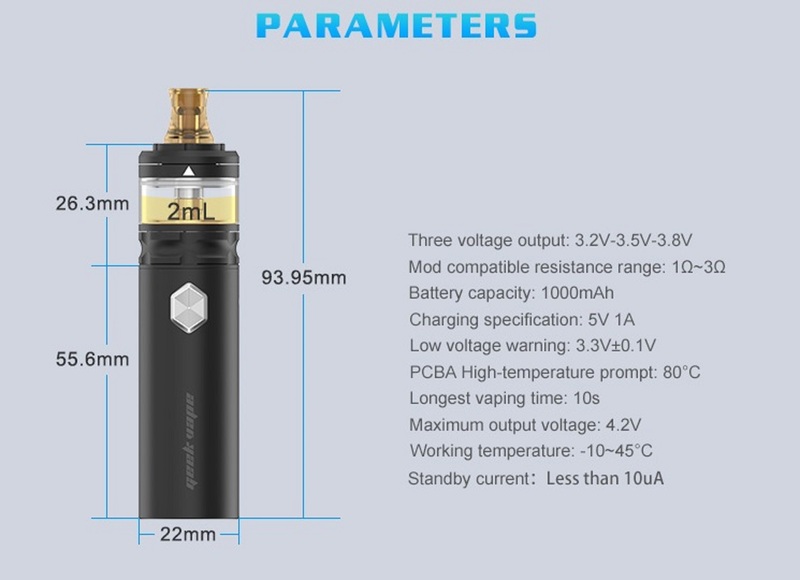 The battery is only suitable for MTL tanks has it only accepts resistances of between 1.0ohm and 3ohm. The Flint tank though i rate very highly on it's own merits and would put it at the top table along with the likes of the Nautilus 2, Zenith and Berserkers. It is only my opinion but i am thoroughly enjoying using the Flint, it's an excellent MTL kit. The size is a big pro as it's so very pocket friendly but the trade off is the battery is only 1000mAh. After saying the battery is only 1000mAh and of course more battery life is always more preferable the Flint is only outputting the same wattage's as a pod system and a pod system with a 1000mAh battery would be considered excellent battery life, so on reflection battery life is neither a con or pro but fair enough. The top-fill i like a lot it opens and secures with perfect tolerance and moves so smooth, with a fill port that means filling is mess free whatever size nozzle you are using. The Flint is MTL and nothing else with it set with the largest airflow hole it's a very airy MTL vape which made me think a DL vape would be possible but if any others say it is i know a lot of things with vaping is opinions but they are kidding themselves. The Flint tank is just so impressive going from the largest hole which i have just desribed right down to the smallest hole which is super tight, personally the third (middle) hole was spot on for me. The flavour is up their for me with the best MTL stock coil tanks like the Zenith and Berserker, i am very impressed. Both coils i preferred on the middle power level which matched having it on the middle airflow setting apart from when i used some nic salts (which i only tried with the 1.6ohm coil) which i preferred on the lowest setting. A great kit for any MTL vaper and ideal for a new vaper who's just quit or is trying to come off the cigarettes, the Flint gives them every chance of succeeding. Battery can be used independently with other MTL coils with resistance between 1.0ohm and 3.0ohm. Obviously because the drip tip can't be removed is a con however personally i would use the supplied drip tip even if it could be removed. I would once again like to thank Carrie for supplying the Flint Starter Kit for the purpose of this review. As i am posting this review in the early hours of Boxing Day here in the UK i hope everyone had a great Christmas Day and will continue to have a great festive season!